Columbia River from I-84. In spots, it’s right by the road. Hubby and I just returned from another trip to see Son and Grandson. Our route takes us down the Columbia River Gorge, one of the most beautiful drives in the U.S. Traveling along Interstate 84 from Boise to Portland, about 150 miles of the trip runs along the lower Columbia River. I am fascinated by the power and beauty of the river. It’s not the largest on the continent, but it travels through some of the most beautiful country on the continent. Starting in the Canadian Rockies, the river twists and turns its way south and west toward the Pacific Ocean. In the lower Columbia River, waterfalls cascade from the lava escarpment into the gorge. On clear days, you can see Mount Hood towering in the distance, keeping watch over the mighty river. 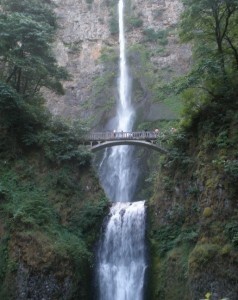 Multnomah Falls, over 400 feet high, not very far east of Portland on I-84. The river is big so the structures on the river are big as well. The dams on the river produce more hydroelectric power than any other river in North America. On our journey to Salem, we pass three of them: John Day, The Dalles, and Bonneville. The river is about a mile wide so these are large dams. None of them is near as large as Grand Coulee Dam on the upper Columbia River in Washington State. Hubby and I were there in 2012. That concrete structure is enormous and is one of the largest dams in the world. We watched the laser show the night we were there. They have changed the show since then so I guess that gives us reason to go back. In our travels along the river, I can’t help but think of all the Indian tribes that lived there long ago. If it hadn’t been for those tribes, Lewis and Clark might have never been heard from again. Time and again, the tribes helped them out with food, horses, and guides. In thanks for their welcoming services, the U.S. government dammed the rivers that gave them their livelihoods, which mostly revolved around salmon. If you read the stories of the construction of the dams along the river, the inundation areas of the reservoirs were tribal lands and stopped the salmon migrations. Some of the Indian communities had been there for centuries. A sacred fishing spot called Celilo Falls was inundated by The Dalles Dam. Tribes still mourn the loss of their tribal traditions associated with that spot. At the same time, the destruction of tribal lands also brought a booming economy to the Pacific Northwest. The electricity produced by those dams helped win World War II when it was used to manufacture airplane plants. It’s an age-old question: Should you hurt a few people for the good of many more? In January, Hubby and I traveled to Oregon and Washington. We drove north along the Oregon coast and spent the night in Astoria on the banks of the Columbia. Astoria is the site of the first American fur post on the west coast (1811), named after the financier of the enterprise, John Jacob Astor. A bridge crosses the river there—the very scary Astoria-Megler bridge. More than 4 miles long, it arches high into the air from the south bank to allow ships and barges to the ports up and down the river. To drive on the bridge, you drive around a pigtail to gain enough altitude to get on the bridge. Once you get past the arch, the bridge flattens out the rest of the way. Climbing to elevation to get on the Astoria-Megler Bridge. You can see the end of the bridge in the background. The photo is taken just after rounding the pigtail. Still climbing up the arch of the Astoria-Megler Bridge. No stopping, standing, or fishing allowed. After crossing the mighty river into Washington State, we visited the state park where the Columbia meets the Pacific. It’s strange to say, but the water piles up where the outgoing force of the Columbia meets the incoming force of the Pacific. The currents are very turbulent and hazardous. Part of the reason it took so long for the explorers to find the mouth of the Columbia was this area is so hard to navigate. A number of shipwrecks occurred there, one of which is still partially visible in the state park. After the arch, the rest of the Astoria-Megler Bridge seemed better although it took a while to get all the way across the river. The bridge is 14 miles from the Columbia’s mouth at the Pacific Ocean. If you ever have a chance to travel along the Columbia River, I highly recommend it. The culture and history along the river are multifaceted and fascinating. And the scenery is worth every gallon of gas.